The bees of New Zealand have been documented quite recently (2007) by the appropriately initialled B. Donovan. However, another one has recently turned up. So far, it is only known in N.Z. from six males collected by me, all on the Tamaki Campus, Auckland. 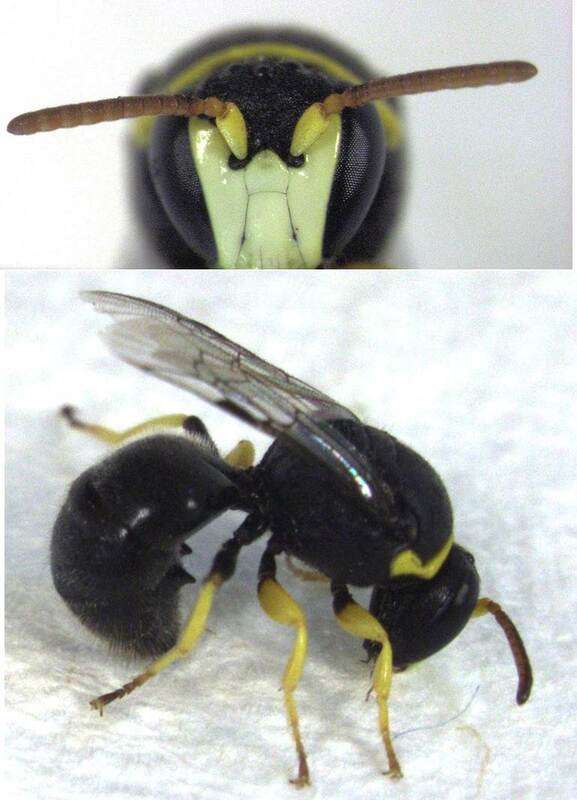 It is a masked bee (see photo) belonging to the vast genus Hylaeus. Keep on the lookout for this new bee in New Zealand. No females have been found yet. It belongs to a subgenus, Gnathoprosopis, not otherwise represented in N.Z. I have identified it as Hylaeus euxanthus, a common and widespread species in Australia (see Houston, 1981). MPI are in the process of getting the ID validated. The first two specimens captured had black mandibles, which is unusual for the species in Australia, and therefore put the ID in a little doubt, but subsequent specimens clearly have yellow mandibles. It would be useful to find females, which will have less of a yellow mask, but so far no luck. The species may be of some interest to those studying pollination ecology in N.Z. There is clearly a lot of scope for further research on this species in N.Z. How widespread is it? Is it spreading? Will it compete with native bees? What are its flower visiting preferences? My specimens were found visiting kanuka flowers in November and December, and sweet fennel flowers in late February. 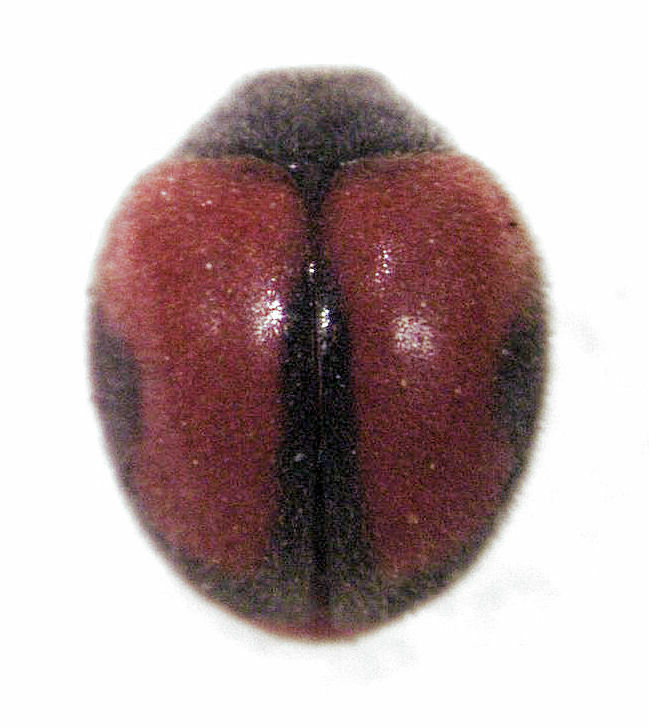 The males have a pair of tubercles on the underside of the gaster (abdomen), which are variably developed. They are clearly visible in the lower photo. The species is immediately distinguished from other Hylaeus in N.Z. by having the first antennal segment (scape) short and entirely yellow. PhD student Josie Galbraith measuring urban birds to assess their health status. 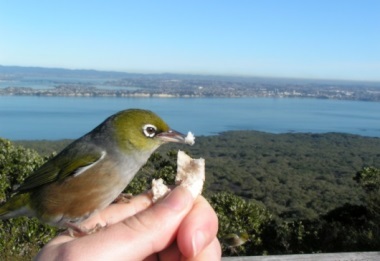 People love feeding wild birds, even in New Zealand where most urban birds are introduced species. More than 5 million loaves of bread, 13 million pieces of fruit and 5 million L of sugar water are fed to birds in six New Zealand cities each year. That is almost 3 loaves of bread per person! The food used is not usually at the expense of the household budget as most people are feeding scraps to birds. As well as putting out food, people like to provide water baths and plant trees to encourage birds into their gardens. Those who live in Wellington (New Zealand’s capital) were least likely to feed birds, but if you owned a free-standing house or a dog you were more likely to provide food. Introduced birds are probably the main beneficiaries of bread and seed in urban New Zealand since not many native birds found in urban areas are grain feeders. Potentially, this may increase populations of introduced birds at the expense of native birds. Silvereye are on of the few native birds in urban areas that eat bread. people should stop feeding birds, but improving how they clean feeding stations and considering putting out food more suitable for native species would be a good idea. Questionnaires were sent to 3000 households in Whangarei, Auckland, Wellington, Nelson, Dunedin and Invercargill. The study achieved a 27.1% response rate, or 801 replies. Jacqueline Beggs is an Associate Professor in the Centre for Biodiversity and Biosecurity, University of Auckland. Australian’s are well known for seizing an opportunity when in foreign lands, but is that the case for this new arrival in New Zealand? Prof Harold Corke speaking next week at University of Auckland. Case study on the development of Amaranthus as a grain crop in China. Jacqueline Beggs is an Associate Professor in the Centre for Biodiversity and Biosecurity, University of Auckland. How much damage could a couple of mice do on a pest-free island? We used a novel experimental approach to demonstrate the importance of island biosecurity. 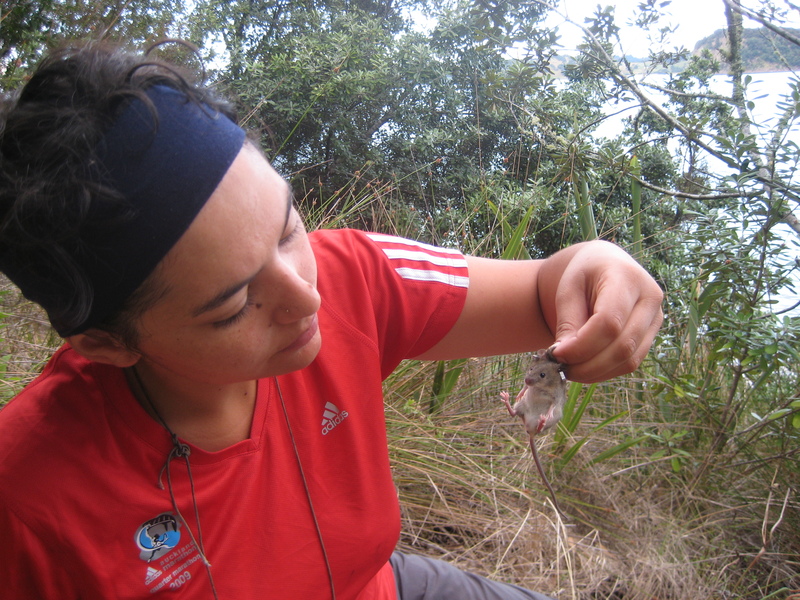 Two house mice (one male, one female) were released onto Te Haupa (Saddle) Island, a Department of Conservation scenic reserve which had previously hosted a mouse population, but had recently been declared pest-free. 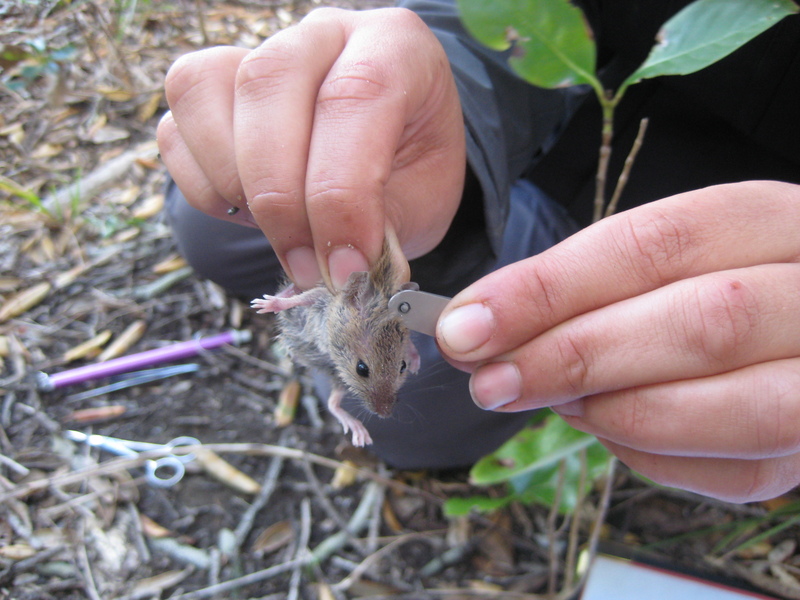 For the following 8 months we returned regularly to the island to undertake live trapping, allowing us to estimate the number of individual mice on the island, and plot the growth of the invasive population over time. 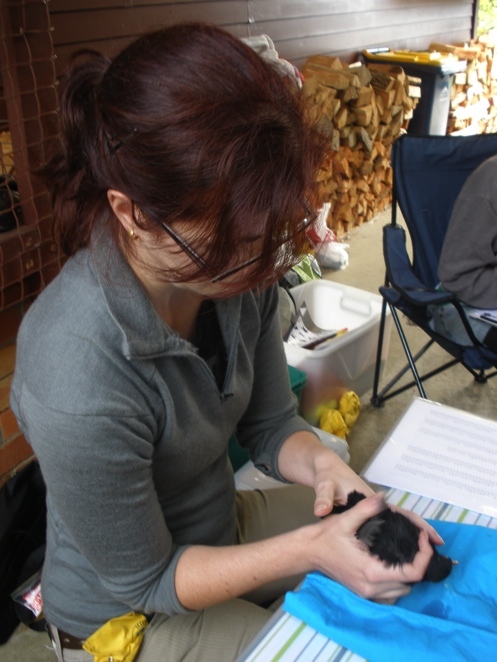 We also took genetic samples from captured mice to confirm descent from the two founder individuals released. After 8 months, the experiment concluded and the population was eradicated using a combination of trapping and poison. We found that population growth was initially rapid, peaking at an estimated 68 individuals 5 months after the release, then stabilising until the end of the 8 month experimental period. This pattern of growth reflects the classic model predicted by invasion biologists, but rarely observed in real-time as, in contrast to our study, the exact point in time when an invasion occurred is usually unknown. A surprise result from our genetic analysis showed that not all of the mice trapped at the end of our experiment were descended from the founding male and female. An unrelated female was first captured 3 months after the start of the invasion, and had produced offspring 1 month later. Genetic analysis suggests that this mouse most likely originated from another island off the north-east coast of New Zealand, almost certainly transported on a boat which had recently visited other nearby islands. The extremely rapid population growth of the invading mouse population, along with the independent mouse incursion we detected, demonstrate the need for vigilant monitoring of our pest-free sanctuaries. For successful conservation and restoration of sites, invasive species populations must be detected early during colonisation to enable swift elimination, before the population becomes established. The Auckland Kereru Project: Following the movements and diets of urban kererū (NZ pigeon) in Auckland. Joint Graduate School in Biodiversity and Biosecurity PhD candidate Alice Baranyovits is investigating how kererū move around fragmented landscapes and more specifically how they utilise the urban environment. In particular she is interested in their diet, particularly where and when they are eating introduced plants. In order to do this she needs your help! There are two ways to contribute as a one-off; by recording your garden plants and/or by recording urban kererū sightings (although you can enter as many kererū sightings as you like). If you would prefer to have a more continual involvement you can register to take part in the phenology study (recording when your plants fruit) or the quarterly kererū count or both! Welcome to the Auckland Ecology Blog! We are ecologists from the University of Auckland School of Biological Sciences keen to share our science. We will be posting about our latest research and findings. Check back regularly for news and new posts.